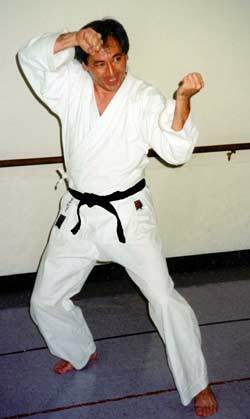 George Donahue practice the first move of Pin'an one (Pin'an two or Heian two in some styles). The first move of some of the basic katas of the Shorin tradition, including Shotokan and its offshoots (and many basic katas of other traditions), is a trained reaction to being startled or surprised. In schools that maintain the old ways, most of the training involved is in what NOT to do. Imagine a parent driving a car with a child (even a grown offspring) in the front passenger seat. If the average parent has to hit the brakes unexpectedly, the first thing that happens as the foot presses the brake pedal is an almost universal startle reaction: The parent throws out his or her right arm to shield the child. * The move is a combination of an effort to restrain the child from slamming forward and an attempt to cushion the child. No conscious thought is involved. It doesn't matter whether the child is firmly buckled or flagrantly unsecured, the parent's reaction is the same. Even people who are ordinarily very slow at reacting, tortoise slow in their movements, do this arm throw with great speed. It's almost instantaneous and sometimes powerful enough to leave bruises on both the parent's arm and the child's torso. There are several rudimentary factors involved in producing this hyper speed. First, there is no time for a windup, either of the limb or the torso—so we skip it. Only with arrows and some guns is a cocking motion necessary. Fists and feet don’t need it. In fact, in all martial arts windups are almost always unnecessary and often are counterproductive anyway, except when the intent is to deceive. The parent in the example above doesn’t take a windup and yet generates great power and speed. Second, there is no attempt to tighten the muscles into a focus position. That would be the same as slamming the brakes on the limb as you slam the brakes on the car. Your arm wouldn’t get into position in time to protect your child. The relaxed, unflexed arm works much like a whip. If there is any tightening at all, it happens after the parent’s arm is completely in the protective position. Third, we don’t focus our intentions or our actions on the arm being thrown out to protect the child. We do it without thought, without concentration, without focus. That way, we can perform many actions simultaneously. In the car, at the same time we’d be throwing out the protective arm, we would be pressing the brake pedal, maybe pressing the clutch pedal, if we had one, maybe violently turning the steering wheel to avoid collision and, if not, then holding the wheel firmly to keep control of the car. Fourth, we don’t imagine a specific attack that will always trigger the first move of the kata. If we get into the habit of thinking that a kata symbolizes the reaction of a defender dealing with an attacker doing exactly Attack A or Attack B, either of which is best dealt with by Reaction C or Reaction D, then we needlessly limit our repertoire, at least. At most, we train our bodies to work in only one or a few specific ways. When things don’t go exactly as scripted, we have to think quickly to modify or overcome our trained specific reaction. Quick thinking is always slower than no thinking. So, I’ve just set out four things we don’t do if we want to succeed in the car or in the kata. The average person can easily double the speed of a reaction by avoiding these four impediments. Unfortunately, it’s sometimes harder to learn to undo something than it is to learn to do something. Although there are several elements we can add to our way of moving, such as proper breathing, use of koshi, arches, compression and torque, and visualization, it’s important to clear out the impediments to speed and power first. Getting back to Pin’an Shodan, or any Pin’an kata, for that matter: Try relaxing as completely as you can while standing in the ready position, using just enough energy to remain standing. Since your arms play very little part in keeping your body erect, they can and should be as limp as wet, over-boiled noodles. At the signal to begin the kata, whip your hands from in front of you to their final position. Don’t worry about being crisp or exact, don’t worry about the path of your movement—your hands can’t go farther than the end of your arms anyway. Don’t even worry about being fast, just whip it. After you’ve consistently doubled your speed, you can begin to think about refining your movements or about the many possible applications of those movements. Then, too, is a good time to begin to add advanced elements to your movements. Once again, however, it’s important to get rid of what is not essential before you attempt to add new elements. * Throwing out your arm to protect your passenger doesn’t really do much to secure the safety of the passenger, but we do it anyway. It’s a small indication of the essential nobility of human nature. ** Gichin Funakoshi-sensei switched the order of Pin’an Shodan and Nidan when he renamed the Pin’an series to Heian, with Pin’an Shodan becoming Heian Nidan and Pin’an Nidan becoming Heian Shodan. Some Shorin schools followed his example, as far as the order of the kata and for those schools former Pin’an Shodan became Pin’an Nidan, and vice versa.